Yup! Christmas is almost here and so are the jolly spirits. I have put up my tree, baked fruit cakes, bought gifts and prepared goody bags. Christmas is taken care of. 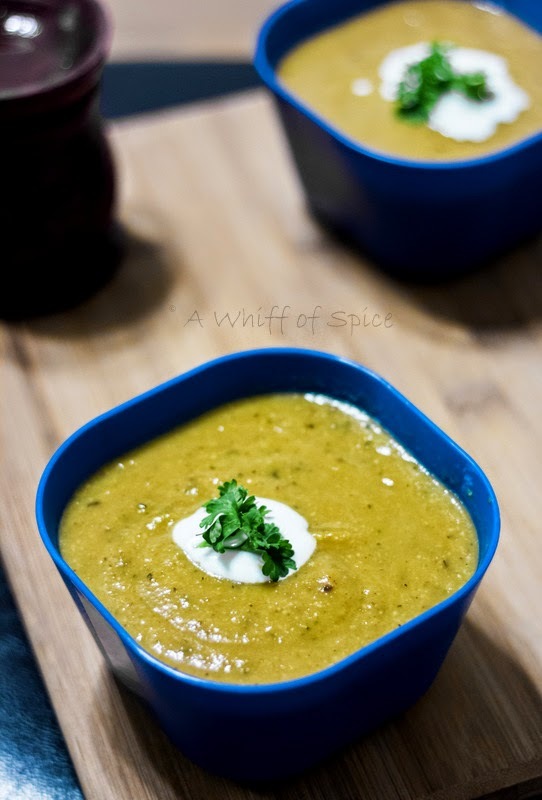 Now lets talk about another deliciousness that winter brings - Soups! The only thing that keeps me going through the winters, is the thought of my kitchen, all warm and toasty, with me stirring my soup pot and feeling like a true blue Cancerian woman straight out of Linda Goodman's book! This year I have gifted myself a Kitchen Aid Immersion Blender, way back in early November because they were on sale in Costco at a ridiculous price of $25... Yeah! you read it correct. A 3 speed Kitchen Aid Immersion bender with chopping and whisking attachment at $25! That's an offer you need to grab with both hands and feet, if required! Armed with a new convenience tool, I marched ahead with gusto into the relatively uncharted territory of blended soups. 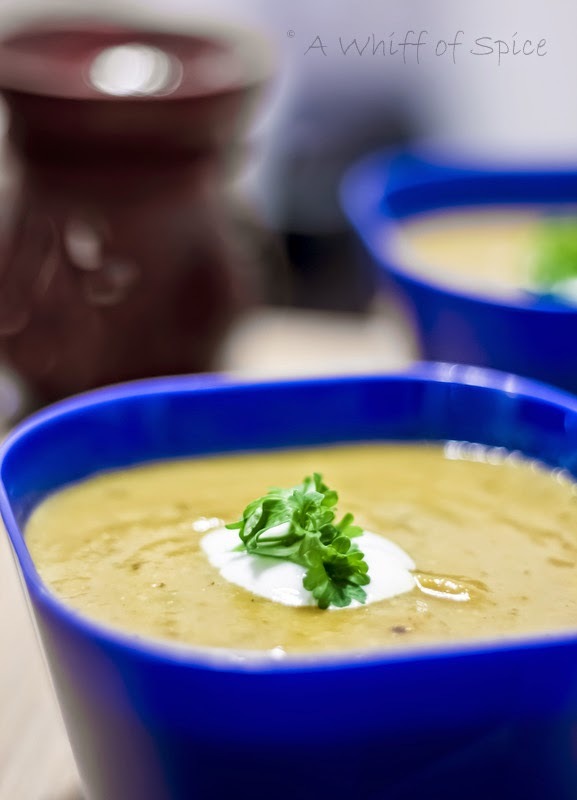 And as expected I was bowled over by the simplicity, convenience and creamy deliciousness of these velvety soups. So presenting the sunny, velvety and mildly nutty soup resonating the summer, that I so dearly miss - Roasted Zucchini and Yellow Summer Squash Soup. Truth be told, I had my reservations abut this soup. Though I love Zucchini and Summer Squash, the prospect of blending them into a baby food consistency is hardly appeasing and hardly gourmet. Chanting the mantra, "We gotta try new food 'cause it might taste good" in a very Daniel Tiger-ish way I prepped up the oven to roast my favorite summer veggies. As I whirred my immersion blender in the pool of chicken stock and big chunks of tender veggies, it slowly melted away into a puddle of creamy goodness. I could feel my inhibitions ebbing way. Of late , I have been scrounging the Pinterest, for a lot of vegetarian and vegan ideas. I like how the Vegans explore unconventional ingredients to work around their dietary restrictions. I am always amazed. Recently I saw the the use of cashew milk to thicken the soup instead of heavy cream. We have been thickening our Indian gravies with cashew pastes for centuries now. But it was the first time, I heard cashews being used to thicken a soup. Naturally, I was intrigued. Cashew milk is just cashews softened in warm water and then blended with little water into a smooth paste. The Roasted Zucchini and Yellow Summer Squash Soup was pretty thick in itself and did not need any thickener. But I was dying to try the cashew milk tip. The cashew milk adds a delicious nuttiness to the soup and I wonder if I can ever make this soup without the cashews anymore. P.S: The best part of this soup was that, after staring at the soup suspiciously for few moments and asking me a zillion question, Sid drank it to the last drop and declared it the best soup till date! Green pepper - 2, halved and seeda and membranes removed. 1. Preheat the oven at 450F. 2. 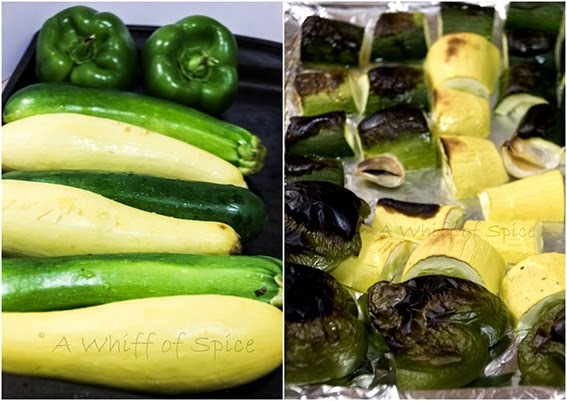 In aluminium foil lined cookie sheet place the big chunks of zucchini, the summer squash and the bell pepper halves. Also toss in the skin-on garlic cloves. Drizzle with one tablespoon of olive oil and salt and pepper. Roast it in the oven for 25-30 mins till the veggies are soft and slightly charred. 4. In a stock pot, heat two tablespoon of oil and add the chopped onion. Once the onions sweat a little add the dried thyme leaves. If using fresh thyme add a little more. Saute till the onions are soft and slightly brown. 5. Meanwhile, peel the charred skin of the green peppers. 6. Once the onions are lightly browned and fragrant, add the roasted zucchinis, summer squash and the skinned bell peppers, along with the delicious juices they released. Also squeeze the garlic pods and add the roasted goodness into the pot. Saute for two more minuets. 7. Add the vegetable or chicken stock and bring the liquid to a boil. Lower the heat and let it simmer till veggies are tender. about 15 more minutes. Do not add any salt till this stage. I used store bought stock and it had plenty of salt. 9. After the vegetables are super tender, blend the soup with either an immersion blender or in a regular blender, in batches. If using a regular blender or a processor, definitely remove the plug on the lid and cover with a thick kitchen towel. This with allow the heat to vent without a creating a big mess. 10. Return the blended soup to heat. Add the cashew milk and bring to a gentle simmer. Check the seasoning and adjust the salt according. The cashew milk not only thickens the soup but also adds a nice nuttiness to the soup. 11. Garnish with a dollop of sour cream or Greek yogurt and some parsley. 12. Serve hot with bread or crackers. Notes/Tip: The addition of cashew milk is purely optional. The soup is pretty thick in itself and does not need a thickener. But the cashew milk adds a nice nuttiness to the soup, which is really nice. Summer Squashes like zucchini, yellow summer squash, golden zucchini etc, are a rich source of Vitamin A and C, magnesium, fiber, folate, riboflavin, phosphorus, potassium and Vitamin B6. In addition, it is high in manganese, a mineral which helps the body process fats, carbohydrates, and glucose. Yellow squash contains negligible fat and no measurable cholesterol. One cup of squash contains about 0.2 g of fat. Cutting down on your fat and cholesterol intake is a giant step towards helping reduce your risk of heart disease. Aside from the complete lack of fat in summer squash, the magnesium quantity has been shown to reduce the risk of heart attack and stroke. Along with its potassium content, magnesium is good for reducing high blood pressure. The vitamin C and beta-carotene levels in summer squash may also aid in preventing the oxidation of cholesterol. As cholesterol in its oxidized form builds up in the walls of blood vessels, such nutrients may reduce the development of atherosclerosis. The presence of the vitamin folate in yellow squash is required by our bodies to remove an unhealthy metabolic byproduct called homocysteine, which may contribute to heart attack and stroke risk. Summer squash is particularly high in concentrations of beta carotene and lutein. Dietary lutein helps to prevent the onset of cataracts and macular degeneration, which often leads to blindness. A cup of summer squash provides about 135 micrograms of beta carotene and 2,400 micrograms of lutein. Summer squash is abundant in antioxidants that keep free radicals at bay. With its high beta-carotene content, summer squash is a great source of protection from pollutants and chemicals that lead to cancer. The high levels of vitamin C helps prevent premature aging and cancer as well as inhibiting cell division.